King Albert of Belgium decorates Willy Coppens, Belgium's Ace of Aces. 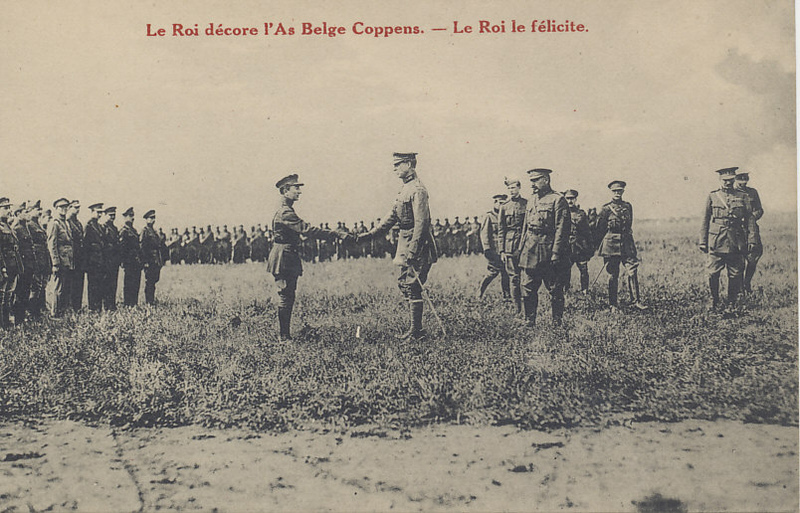 Coppens describes this June 30, 1918 ceremony, in which he was awarded the Ordre de la Couronne in his memoir Flying in Flanders. Service photographique de l'armée Belge. Willy Coppens was Belgium's 'Ace of Aces', its leading ace, with 37 kills to his name. His preferred victim was the observation balloon, typically strongly defended by both anti-aircraft guns and fighter planes. He was the author of the memoir, Flying in Flanders.